I know to most of you this sounds crazy but it's the honest to God's truth that 2 barrel carbs are actually bigger (in most cases) than 4 barrel carbs, which also means that 2 barrel carbs are more sluggish and get LESS gas mileage than 4 barrel carbs do, and here's why: Most 2 barrel carbs are around 350 cfm. That sounds small until you consider the fact that if that same "little" 2 barrel were a 4 barrel, it would then be a 700 cfm carb because you would have 350 cfm primary AND 350 cfm secondary throttle plates. With a 2 barrel carb, you get what you get. In other words; if it is a 350 cfm carb, it's always a 350 cfm carb. It's exactly the same as a 700 cfm 4 barrel carb using just the primary side to run around town with, which is pretty much how all 4 barrel carbs work, whether it's a mechanical secondary or a vacuum secondary. Pretty much all mechanical secondary 4 barrel carbs only use the primaries while driving under about 1/3rd throttle, and with ALL vacuum secondary carbs you are always only on the primaries until the engine can "pull" enough air velocity to actuate the secondaries as the engine's RPM comes-up high enough to create that kind of velocity, so no matter what, for MOST of your normal driving, you are only using the primaries for normal driving. Well, if you stuck a 700 cfm carb on your stock to mild small block, that's a pretty hefty size carb for that little engine and it IS going to run sluggish and not get good gas mileage, or have good off the line and low-end "get-up and go" because it is just too big of a carb. Well, that would mean a 350 cfm 2 barrel carb is also too big then because you are running around on the exact same size throttle plates as a 700 cfm 4 barrel. A 600 cfm 4 barrel (speaking about square bore carbs here) has a 300 cfm primary and a 300 cfm secondary. That means for MOST of your driving needs (under about 1/3rd throttle) you are actually driving around with the equivalent of a 300 cfm 2 barrel, so right out of the get-go a 600 cfm carb is actually SMALLER for normal driving conditions than a 350 cfm 2 barrel. This means the 600 cfm 4 barrel will actually have better throttle response, quicker off the line power and much better low-end get-up and go compared to a 350 cfm 2 barrel. This is compounded even more (to your advantage) when you are talking about a vacuum secondary 600 cfm 4 barrel because no matter what you do, if you mash the gas pedal to the floor, ONLY the 300 cfm primaries will open UNTIL the engine can create enough velocity through it to open the secondaries, unlike a mechanical secondary carb where if you mash the gas to the floor, all 4 barrels will open up and TWO accelerator pumps will squirt fuel into the barrels, thus causing horrible gas mileage if you do that at too low of an RPM. Now obviously if you have a mechanical secondary 600 on your car and you drive with your foot in it pretty much continuously, then that's a bit different other than the fact that any other time, the 4 barrel will out perform the 2 barrel for throttle response and gas mileage. Let's put this into even better perspective. Look at the 2 barrel carb image above and what do you see? HALF of a 4 barrel! Now imagine if that were a 375 - 500 cfm 2 barrel... most of you would think "better throttle response and gas mileage" because it's a 2 barrel, right? Well, WRONG! It's really HALF of a 750 or 1,000 cfm 4 barrel!! A 375 cfm 2 barrel is equivalent to a 750 4 barrel, and a 500 cfm 2 barrel is equivalent to a 1,000 cfm 4 barrel for around town and lower RPM driving. Throttle plate size is throttle plate size. They don't know how many of them are in a given carburetor. 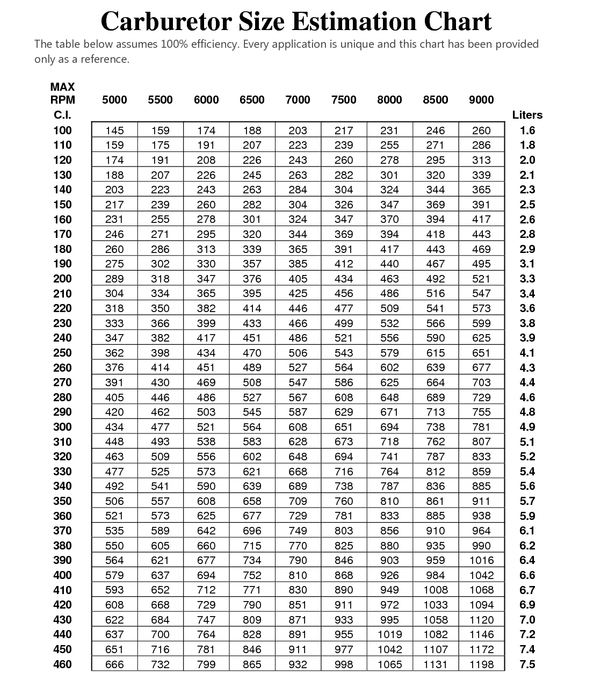 In other words, 500 cfm throttle plates are the same no matter what kind of carb they are in. Now, how would your engine run if you stuck a 1,000 cfm 4 barrel on it? Yeah, not so good, so what's the difference of driving around with a 500 cfm set of throttle plates in a 2 barrel, or running around on the 500 cfm throttle plates on the primary side of a 1,000 cfm 4 barrel? Nothing! It's simple carb logic 1.01. Now look at the 4 barrel image to the right. It is exactly double what you see in the 2 barrel image above. If that were a 750 4 barrel and you had a stock or mild 350 Chevy, you'd probably think it was too big of a carb for that engine (if you were smart about carb sizes anyway). Well, that 750 is equal to a 375 cfm 2 barrel under normal driving conditions, which in turn, makes the 2 barrel NO different than sticking-on a 750 4 barrel. The ONLY time this isn't so true is with the vacuum secondary carbs because when you nail the throttle from a dead stop, ONLY the primaries will open until the engine can make enough velocity going through the primary side to "siphon open" the secondaries, so in reality a 750 cfm VACUUM secondary carb isn't always too big for small, mild or stock engines simply because of its design, but we're talking in "general terms" here. Now think in terms of a 500 cfm 2 barrel. I know a lot of guys think a little 500 cfm 2 barrel carb will give you better throttle response, better gas mileage, etc than a 750 4 barrel, right? Well again that is completely WRONG! That "little" 500 cfm 2 barrel is (again) HALF of a 1,000 cfm carb, and what normal sized, even halfway serious street/strip engine can possibly use a 1,000 cfm carb? Pretty much none of them! Just to point this out in math, for qa 350 cubic inch engine to be able to pull 1,000 cfm of air to utilize that size of a carb, it would have to be spinning at upwards of 10,000 RPM!! Even something the size of a normal big block, say around 450 cubic inches, it would have to be spinning at about 7,700 RPM to utilize a 1,000 cfm carb!! So why would sticking half of that carb on a mild engine be any better than going with something like a 500 cfm 4 barrel which would be using little 250 cfm primaries and secondaries that are HALF the size of what a 500 cfm 2 barrel throttle plate size would be, which will give you instant throttle response, great gas mileage, and quick off the line pulling power over the bigger 2 barrel. A 600 cfm 4 barrel would STILL be better than a "little" 500 cfm 2 barrel because again, the primaries are only 300 cfm, not 500 and those are what you are driving around on 90% of the time! It also makes a BIG difference in how an engine responds and runs. The bigger the barrels and throttle plates, the slower the air speed (velocity) is going through them. A slow velocity makes pulling through the boosters (the main jet activators) much slower, which in turn makes your engine sluggish off the line and at low to mid RPMs. If you want to see what size 4 barrel carb (cfm wise) is best for your engine, (running at max RPM), this size chart will help. Keep in mind though, these are MAX numbers for running at MAX RPM, so for instance; if you have a 350 Chevy that is either stock or built for mild performance (say, 400 HP and less), you aren't going to be running AT max RPM very often, so you have to look at where you will be driving the most, and then add a little for those times when you want to stick your foot in it. You can waive your mouse over the image to enlarge it to see it better. Now, look at the 350 sized engine. For most guys running around on the street with a mild engine, the best all around size 4 barrel would be in the 500 - 550 cfm area considering that MOST flat tappet and hydraulic roller cams for mild street use "nose over" (peak their power curve at) about 5,000 - 5,500 RPM. This means in that sized carb, you are running around most of the time with 250 - 275 cfm primaries! That's a hell of a lot smaller than what a 350 - 500 cfm 2 barrel would have in it. Now, I know I'm going to get the emails from guys saying that if they ran a 250 or 275 cfm 2 barrel on their car, it would Peter-out at only about 2,500 - 3,000 RPM. Well thank you Dr. Obvious's. We're not talking about running at full or max RPM here. We're talking about running around town in your average RPM range, which is usually below 3,000 RPM, so IF you are comparing apples tp apples, for normal driving, which includes gas mileage and off the line get-up and go, it is a fact that even something like a 350 cfm 2 barrel will be more sluggish and will get less mileage than a 500 or 600 cfm 4 barrel, which supports my argument that a small 4 barrel is pretty much always better for throttle response, gas mileage and off the line get-up and go power than what most would consider to be a "small" 2 barrel. If you want to learn more about this kind of stuff, in much greater detail, be sure to check out our Auto Shop Videos series by clicking HERE. We have one titled "Performance Carburetors" that covers all of this kind of stuff and MUCH more. These make great Christmas, Father's Day and Birthday gifts!